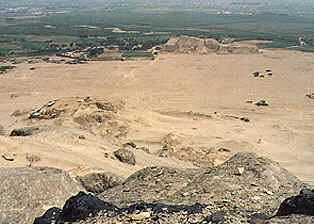 The Huacas del Sol y de la Luna are located in the lower to mid valley, on the left bank of the Moche river on a plain below the imposing Cerro Blanco. Today the Huacas are surrounded by farmland in the province of Trujillo, department of La Libertad, five kilometers south of the city of Trujillo and 6 kilometers inland. We don't know the original names of these monuments, but they have been called the Huacas del Sol y de la Luna for the past century.